I'm grouping Scotland, Northern Ireland and Ireland as the "British Isles" along with England and Wales (not yet played in those two countries). 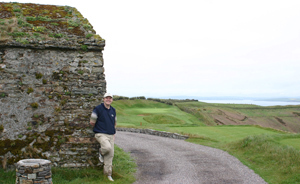 Golf was born in Scotland, and throughout that country, and Ireland (including Northern Ireland) as well, there are copious amounts of stunning links and parkland golf courses. Whereas in America, it seems the best coastline is reserved for the houses of rich folks, in the British isles, golf courses claim that land and offer it up to the everyday player.